Does anyone have any experience with this? I have a friend whose horse has had two episodes of colic in the past week. She is about 10 month pregnant and this second episode has landed her in the vet clinic for a couple days--they are unsure if they can help her and the vet has told her the colic is due to sand built up in her. Anyway i have heard of this before and it makes me very nervous. And I am just wondering if I should be giving sand clear or something to my horses to avoid this happening. I do feed on the ground but try to avoid sandy areas. Do any of you give sand clear periodically? when and how much? Any thoughts on this issue? I know people that give a monthly or weekly dose Metamucil or Sand clear as preventive. Think Saddletramp was the one who said Walmart MTM (metamucil) cheaper than the horse one?????? I keep it on hand but never had the problem. I'm wondering if putting mats or something down if the horse throws food out to eat would help limit sand/dirt intake? Even when you put hay etc in a feeder, 9x out of 10 then throw it on the ground anyway. A huge tub for feeder may help. Naw...I wasn't the one to recommend something from WalMart, (my least fav store)...but I did tell of a boarder who fed dry jello sprinkled into their horse's grain ration. They actually found a green apple flavor jello! (It was marked sugar-free but contained just as much sugar as regular jello.) I think they fed it at a rate of one lg. box per day for a week or longer. It was supposed to work the same as SandClear, etc., but it's hard to say if it did or not. I use an equine product (something with whole psyllium, I believe) a few times a year. It appears that we don't have alot of sand in our area, but a cool experiment is to shovel a cup or so of the topmost layer of soil into a resealable wide-mouth jar, lid it, shake it vigorously and then let it sit for several days. The different types of soil will either perc to the top (like a light mulch), or settle to the bottom (like sand). If you've used a nice clear jar, you can see the different soil layers as they settled. I was surprised at the amount of soil in my sample. 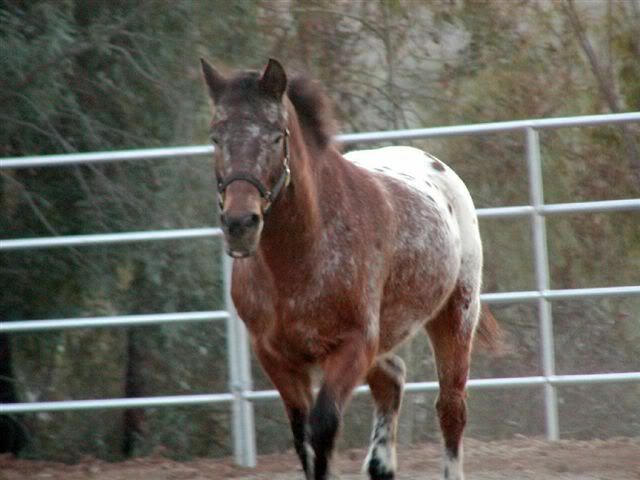 Dodi- Any idea what the docs want to do to help your friend's mare? Colic is not so uncommon with mares in late pregnancy, has to do with the size of the foal and it's position. A warm bran mash daily and free access to warm water should help. My vet said sand-colic is usually not a problem unless the hay or grain has sand on it or in it. If you feed on a muddy ground where the hay is muddy when they eat it, it could be a problem. We use the large plastic watering troughs in each coner of the arena to feed the hoses when thay are turned out. We're on sand and have to use Sand Clear every month as a purge for 5-7 days to avoid an expensive vet call.Alot of people use metamucil and generics. My vet told me it's not near as strong as veterinary grade. After a $250 vet call for sand colic we decided to go with the best psyllium product we could get.A way to test is take 5-6 manure balls in a zip lock baggie add water, and break up the balls,hang bag to tilt it and wait .If after an hour or so you have 1/2 teaspoon of more of sand ,you are going to have trouble.Our whole county is sand,so everyone here deals with this on a regular basis.There was only one that I know of that was so bad had to have surgery (he made it). With your friends horse being in foal ,I doubt she has as much as he had for just plain lack of room. So far so good, the vets have treated her with some very strong sand clearing something(at $100 a bag....) so far the foal is still alive and the mare seems to be out of danger for now! Even though her mare only has like 5 weeks to go if the foal is born now it will not make it so were just hoping the colic is done and all will be well. The first time she coliced although they talked with the vet they just treated on their own--thinking it may be due to the position of the foal etc...thank goodness the second episode they rushed her in. At first the vet really thought they may have to put her down! I guess he has told her to treat her(and all her horses) at least once a year with sand clear, she said her horses do seem to eat muddy grass/leaves in the spring and fall and that may be where they are getting the sand from. I do feed on the ground but in grassy areas or now on top of the snow. should I be worried? Should I treat them ? Are horses normally able to expel sand that is in their system??? I would think that when horses graze, they would run the risk of ingesting sand also, Hook....as some grasses, if tugged on will yield their dirt/sand covered roots to some extent. I read about the same type of "test" yesterday, powerstroke! I wonder how reliable it is tho....wonder if there are horses out there who rarely or don't ever pass any sand with their stool....if we could get a false negative....I'm intrigued tho!